Both adult male and female heartworms can live in the heart and the large adjacent vessels. These heartworms can survive up to 5 years, with females producing large numbers of microfilariae (young worms). The microfilariae (young worms) live inside your pets bloodstream. They can survive there for up to 2 years. They cannot grow into adults in the dog, but must first pass through a mosquito as an intermediate host. When a mosquito bites a dog who is infected, it ingests microfilariae. In 10 to 30 days afterwards, the microfilariae will develop into larvae, which are now infective to dogs. The infective larvae are found in the saliva of the mosquito. When a mosquito bites a dog, the infective larvae are deposited beneath the skin where they further develop for the next 3 to 4 months. They will then enter the bloodstream and move into the heart and the adjacent vessels where they sexually mature in only 2 to 3 months. Heartworm disease, also known as Dirofilariasis, is a serious and potentially fatal disease in dogs. 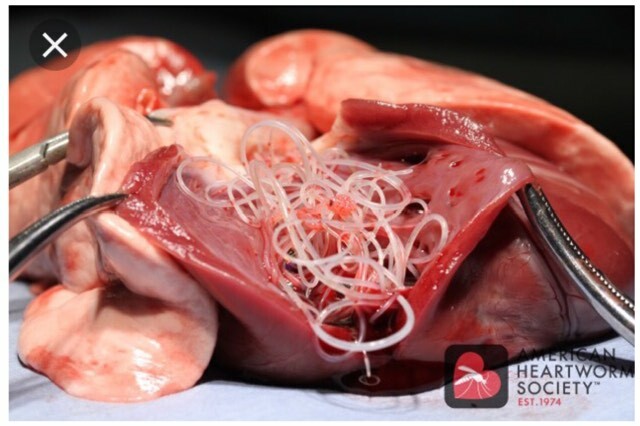 It is caused by a worm called Dirofilaria immitis and it can be found in an infected dog’s heart and large adjacent vessels. These female worms are normally 6 to 14 inches in length and 1/8 inch in width, the males are smaller. Any one dog can have as many as 300 worms! How, When, And Where Can This Happen? Unfortunately, heartworm disease occurs all over the world. In the U.S. it was, at one time limited to the south and southeast regions. This disease spread quickly and is now found in almost all regions of the U.S. and Canada, mainly where mosquitoes are prevalent. An intermediate host, the mosquito, is needed because this disease is not spread directly from one dog to another. Dogs under 1 year of age are not normally diagnosed with heartworms due to the (approximate) 7 month period it takes for the worms to mature once the dog has been infected. The number of infected dogs and the duration of the mosquito season are very important factors in the severity of the disease in any given area. What Are The Effects And Signs? Adult Worms: Cause disease by “clogging” the heart and major blood vessels leading from the heart, this in turn, interferes with the hearts valve action. Because of the clogged heart, the blood supply to the other organs, particularly the liver, lungs, and kidneys, is significantly reduced. This can lead to serious organ malfunction. Many infected dogs don’t show any signs of the disease, but once the signs are evident, the disease is usually well advanced. The most obvious signs of heartworm disease are: a soft, dry, chronic cough, weakness, shortness of breath, loss of stamina, listlessness, and nervousness. These signs are most notable after exercise, and even fainting can occur. Take your pet to your veterinarian if you are concerned with heartworm disease. Your veterinarian can hear abnormal heart and lung sounds by listening with a stethoscope. In some advanced cases, where congestive heart failure is occurring, there is a possibility of swelling in the legs and abdomen due to fluid buildup. Weight loss, poor body condition and anemia can also be noted. If a dog is severely infected there is a chance the dog could die suddenly during excitement or exertion. Microfilariae (young worms): Circulate throughout the body but remain mostly in the small blood vessels. Because they are about the same width as the vessels, they can cut off blood flow through those vessels. Your pet’s lungs and liver are primarily affected. The destruction of the lung tissue leads to coughing, while Cirrhosis of the liver can cause jaundice, general weakness and anemia. This is because the liver plays an essential part in maintaining your pet’s health. In some cases, the kidneys can also be affected and can cause poisons to accumulate in the body. further diagnostics are essential in determining whether or not your pet can tolerate the treatment. Dependent upon the case, your veterinarian might recommend one or all of the following procedures before the testing begins. A blood sample is placed under a microscope for evaluation of heartworms. If microfilariae are found, the test is positive, if none are found, the test is negative. Anywhere from 5 to 10% of infected dogs do not test positive, this is due to an acquired immunity to the stage of the heartworms. In these particular cases, if heartworm disease is suspected, some further testing may be required. Normally, an x-ray of a heartworm disease positive dog’s heart will show heart enlargement and swelling of the large artery leading from the heart to the lungs. These signs are considered probable evidence of heartworm disease. An ECG is a pen tracing of the electric currents that are created by the heart. It’s used to determine the performance and the level of the disease in the heart muscle. This is performed by injecting a contrast material into a blood vessel or even directly into the heart using a catheter taking a series of radiographs of the heart and adjacent blood vessels. Unfortunately, this technique can be expensive to conduct and can sometimes be dangerous in dogs with advanced heart disease. It is not routinely used by veterinarians, but can be in some selective cases. Complete blood counts (CBC) and other blood tests used to determine kidney and liver function are performed on blood samples in most cases of heartworm disease. Testing urine also helps determine proper kidney function. These tests are essential in determining whether or not the dog’s general condition makes it possible to tolerate treatment. This test measures how long it takes for your pet’s blood to circulate. It is performed by injecting a dye into the dog’s main, front leg vein and measuring the time it takes for the dye to reach the eye. Blood circulation takes more time in dog’s who are heartworm positive. This test can be used to determine the dog’s chances of responding to the treatment. Just like with any other treatment, there are some risks involved in treating dogs with heartworm disease. In some advanced cases, it is much safer to simply treat the heart disease rather than treatement to kill the worms. Treatment to destroy adult worms. An arsenic drug is injected into the bloodstream, normally 4 separate timesand 12 hours apart, to kill the heartworms that reside in your pet’s heart and adjacent vessels. Dogs are normally “hospitalized” for 2 or 3 days for this treatment because arsenic is poison which literally poisons the worms. Arsenic is toxic to the dog’s kidneys and liver but many dogs with heartworms already have some kidney and liver damage. This is an added risk, but it is necessary. This is why it is so important to assess your pet’s kidney and liver function before beginning treatment. Complete rest is Essential after treatment. After a couple days, the adult worms begin to die and start the decomposition process. As they break up they are then carried to the lungs where the become lodged into the small blood vessels. They are eventually reabsorbed by the body. Because this is a dangerous period, it is absolutely necessary that your pet be kept calm, quiet, and not be allowed to exercise for 1 month following the treatment. A cough can be noticeable for 7 to 8 weeks after treatment. If a negative reaction occurs during treatment, they will have to be stopped immediately. Treatment can be tried again in 4 to 6 weeks during which time your veterinarian can treat your dog to improve its general condition. In the weeks following initial treatment, if you notice reactions such as depression, fever, loss of appetite, or shortness of breath, notify your veterinarian immediately! There are many drugs available to kill microfilariae. One of the many drugs is used 6 weeks after the heartworm treatment to kill the adult worms. It is given 1 to 3 times per day for 7 days with food or after a meal. 1 to 2 weeks after, the blood will be retested for microfilariae. If your pet tests positive, the 7 day treatment will be repeated until the blood tests negative. Like the arsenic, this drug is also a poison and can cause some kidney damage. Because this is the case, this treatment must be given according to the directions and under the supervision of a licensed veterinarian. This drug can cause vomiting and weakness. In some cases treatment must be stopped and tried again at a later date. In some cases, if the heartworm disease is advanced and is accompanied by either one or both liver and kidney disease, or if the arsenic injections were too severe surgery can be performed to remove as many of the worms as possible. Because some dogs are in this condition, the survival rate is lower, however, sometimes surgery is the only option left to try and save the dog’s life. If the heartworm disease is advanced enough, your dog may need to be treated with antibiotics, diuretics to remove fluid buildup, special diets, and even digitalis to help improve your pets heart function prior to the heartworm treatment. Can I Prevent My Dog From Getting Heartworms? It is essential to start preventative treatments, even if your dog has already gone through heartworm treatment, because they can be reinfected. Treatment to kill infective larvae. This preventative drug can be administered in powder, liquid, or pill form. You veterinarian may also offer a special diet that contains this drug. It is to be given daily from just before the start of the mosquito season to 2 months after and all year round in those warmer, moist climate zones. It kills the infective larvae that is deposited under the skin of the dog, by the mosquito. Dogs who live in areas where heartworm disease has been seen should be tested once a year at MINIMUM. Remember to put your dog on a preventative treatment which normally consists of 1 chewable tablet given every 30 days. Not on heartworm prevention? Call Paw Prints, Ltd veterinarian today and keep your pet safe from heartworms!